Behavioral recovery in the presence of the high-impact ampakine, CX1837. Behavioral recovery after stroke was assessed on grid-walking (A, B) and cylinder/forelimb asymmetry (C) tasks. Analysis of forelimb (A) and hindlimb (B) footfaults revealed a significant increase in the number of footfaults compared with baseline and time-matched sham-treated controls. Administration of CX1837 (0.33 or 1 mg/kg) resulted in a gradual yet steady dose-dependent decrease in the number of footfaults compared with vehicle (30% HPCD)-treated stroke animals. Assessment of forelimb asymmetry using the cylinder task (C) showed that the mice had a greater tendency to spend more time on their left forepaw poststroke as revealed by an increase in the left/right ratio. Treatment with CX1837 resulted in a steady dose-dependent gain of function of the right forelimb. Data are shown as mean ± SEM for n = 8 per group. **p < 0.01, ***p < 0.001 compared with sham controls; #p < 0.05, ###p < 0.001 compared with stroke plus vehicle-treated animals. Behavioral recovery in the presence of the low-impact ampakine, CX1739. Behavioral recovery after stroke was assessed on grid-walking (A, B) and cylinder/forelimb asymmetry (C) tasks. Analysis of forelimb (A) and hindlimb (B) footfaults revealed a significant increase in the number of footfaults compared with baseline and time-matched sham-treated controls. 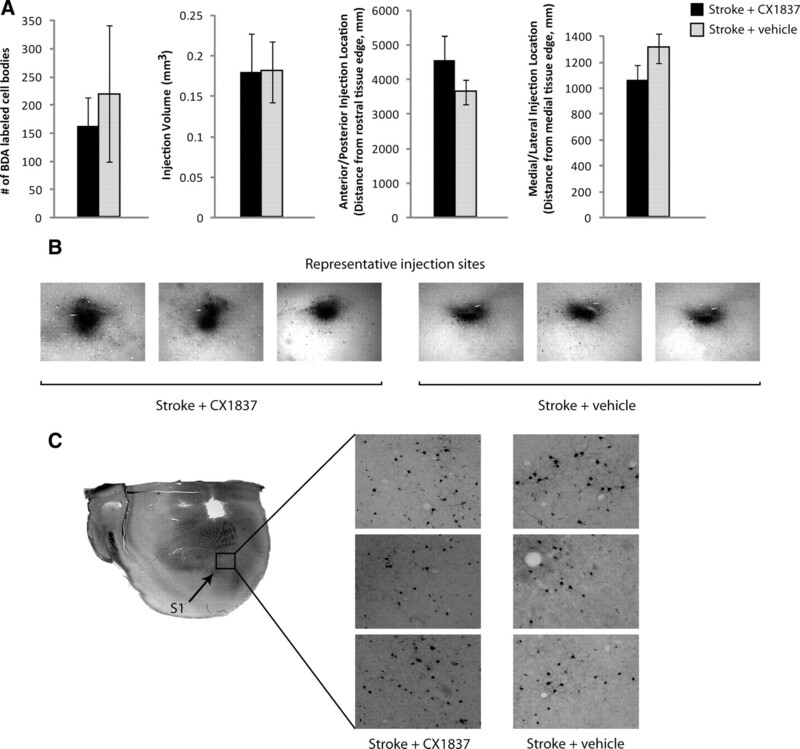 Administration of CX1739 (3 or 30 mg/kg) resulted in a small yet nonsignificant decrease in the number of footfaults compared with vehicle-treated stroke animals. Assessment of forelimb asymmetry using the cylinder task (C) revealed that treatment with CX1739 did not result in a decrease in the left/ratio and were similar to stroke plus vehicle-treated controls. Data are shown as mean ± SEM for n = 8 per group. ***p < 0.001 compared with sham controls. Effects of CX1837 and CX1739 on EPSPs. To assess whether CX1837 and CX1739 crossed the BBB and were having an effect synaptically, EPSPs measures were recorded from anesthetized animals in vivo, with the positioning of the electrode shown in B. Administration of CX1739 (5–20 mg/kg, i.p.) resulted in an immediate increase in EPSP amplitude (A) that was dose dependent (C). CX1837 (0.2–10 mg/kg, i.p.) also resulted in an immediate and dose-dependent increase in EPSP amplitude (D) that is larger in effect than CX1739. The effect of CX1837 is also dose dependent (E). Data points that are shown represent the mean ± SEM. N = 4 per group. **p < 0.01 compared with controls, after analysis using a one-way ANOVA and Dunnett's multiple-comparison test. Ampakine-mediated alterations in BDNF expression. 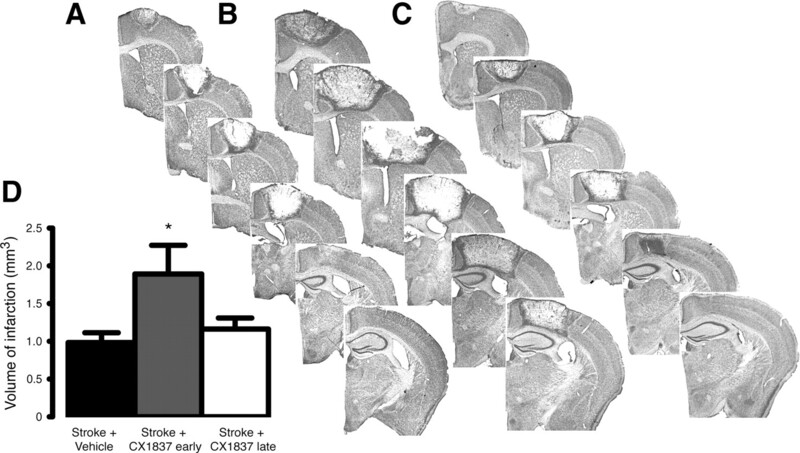 CX1837 mediates BDNF release within the periinfarct cortex poststroke. BDNF expression levels (A) were elevated 7 d after stroke. Treatment with CX1837 from day 5 after stroke resulted in a significant increase in BDNF levels, whereas CX1739 did not alter the level of BDNF expression compared with stroke control. No significant changes in BDNF levels were observed on the contralateral hemisphere (B). Assessment of BDNF receptor activation TrkB/p-Trk showed a significant increase in activation after CX1837 treatment within the periinfarct cortex poststroke (C, E). Assessment of TrkB/p-Trk in the contralateral hemisphere showed no changes between treatment groups (D, F). Data are shown as mean ± SEM for n = 4 per group. *p < 0.05, **p < 0.01, ***p < 0.001 compared with sham controls. 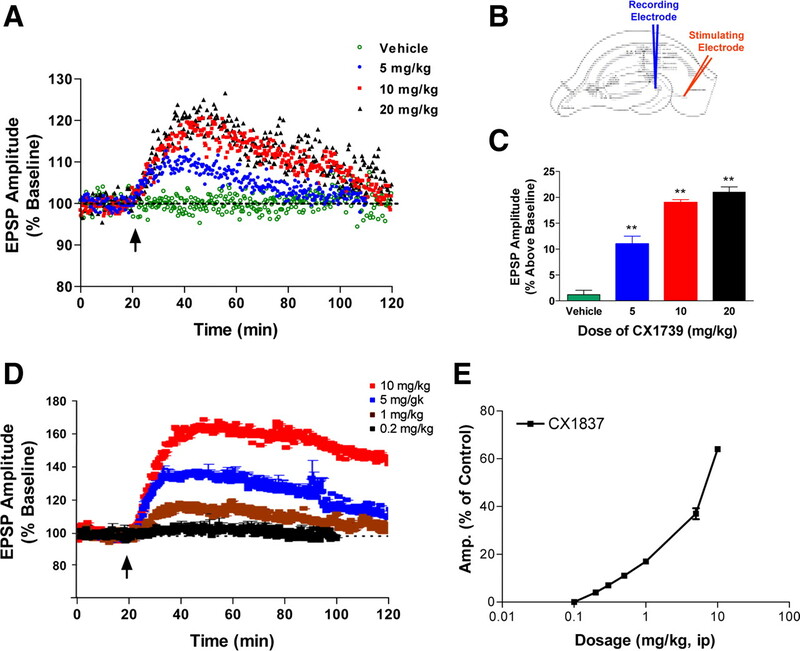 The BDNF ligand decoy, TrkB-Fc, negates the CX1837-mediated gain of behavioral function. BDNF blockade within the periinfarct cortex was achieved by infusing TrkB-Fc-impregnated hydrogel into the stroke cavity. Behavioral recovery was assessed after CX1837 treatment in the presence and absence of TrkB-Fc on grid-walking (A, B) and cylinder/forelimb asymmetry (C) tasks. 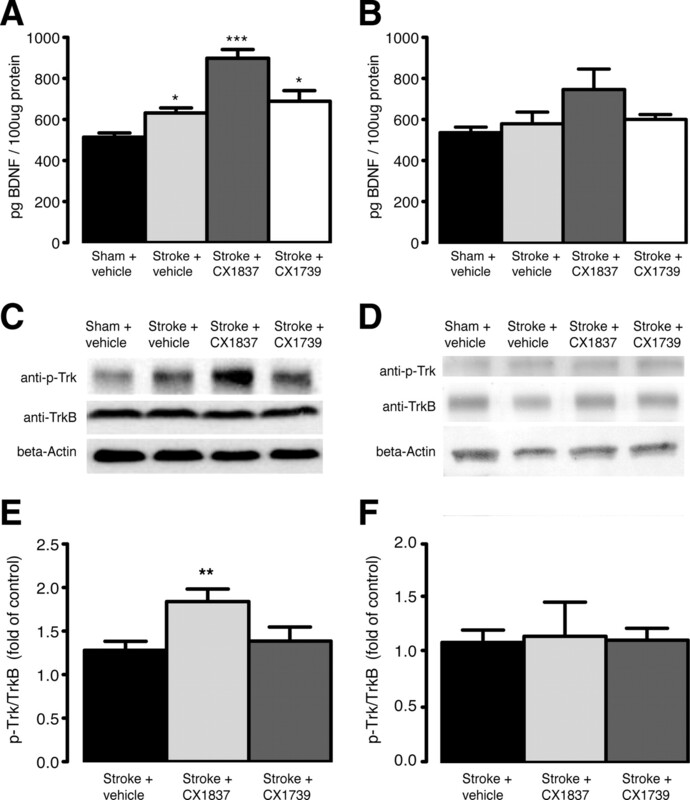 Implantation of the TrkB-Fc-impregnated hydrogel on day 5 after stroke resulted in a complete blockade of the CX1837-mediated gain of behavioral function on both the grid-walking and cylinder task. Furthermore, vehicle-treated stroke animals that received the TrkB-Fc hydrogel showed impairment in the normal gain of behavioral recovery for hindlimb footfaults (B). These results show a requirement for local periinfarct BDNF levels in facilitating functional recovery. The tables next to A–C show the statistical comparisons between treatment groups at 42 d after stroke. Data are shown as mean ± SEM for n = 8 per group. ns, No significance. **p < 0.01, ***p < 0.001 compared with sham controls; ##p < 0.01, #p < 0.001 compared with stroke plus vehicle-treated animals; >p < 0.001 compared with stroke plus CX1837-treated animals. AMPAR antagonism impairs behavioral recovery. 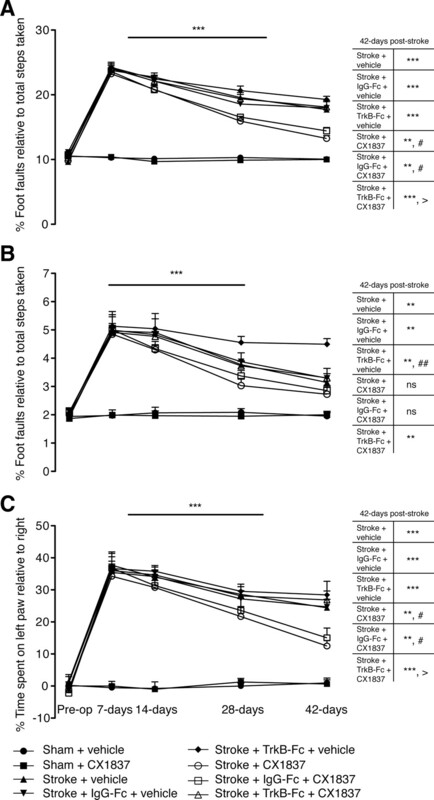 Loss of behavioral recovery was assessed after administration of an AMPA receptor selective agonist, CFM2 (50 μmol/kg), on grid-walking (A, B), cylinder/forelimb asymmetry (C), and reaching (D) tasks. Treatment with CFM2 resulted in a significant increase in the number of footfaults on the grid-walking task (A) and a decrease in the number of pellets successfully retrieved on the reaching task (D). Data are shown as mean ± SEM for n = 10 per group. *p < 0.05, **p < 0.01, ***p < 0.001 compared with sham controls; #p < 0.05 compared with stroke plus vehicle-treated animals. BDA injection volume and location are uniform across experimental groups. There were no significant differences between the number of BDA-labeled cell bodies, BDA volumes, and location between stroke plus vehicle and stroke plus CX1837-treated animals (A). Photomicrographs show representative BDA injection sizes for three animals for stroke plus vehicle and stroke plus CX1837 (B). Sample photomicrographs show representative imaged of BDA-labeled cell bodies in somatosensory cortex (C). Data shown are averages ± SEM for n = 4 per group. Patterns of cortical connections in control and in conditions of AMPAR conductance. A small injection of the neuroanatomical tracer BDA was placed into the forelimb motor cortex adjacent to the stroke site 6 weeks after stroke. 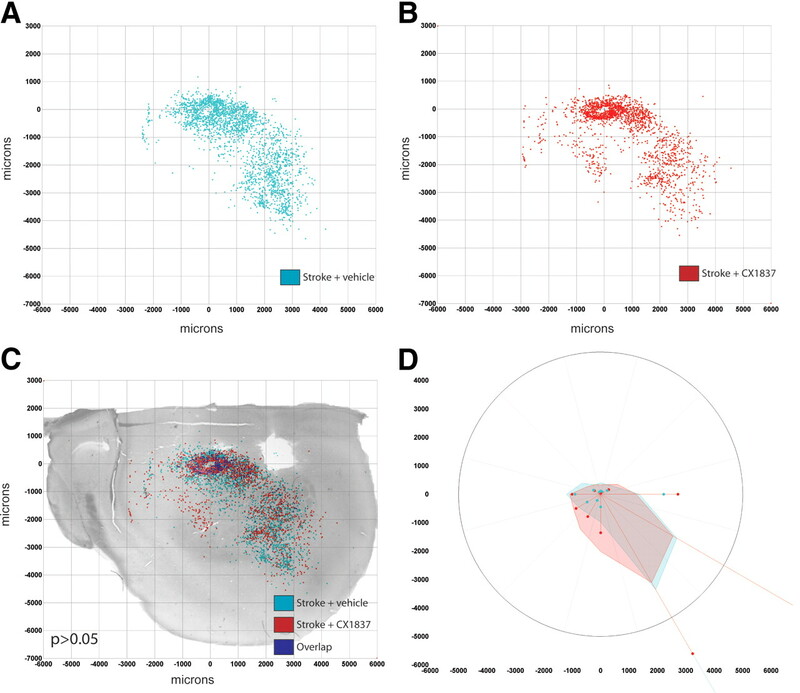 The location of all labeled cell bodies in the forelimb motor cortex, forelimb and hindlimb somatosensory cortex, and facial (whisker) somatosensory cortex were digitally plotted. These plots convert the location of all the axonal connections of forelimb motor cortex into x/y plots, which are then grouped according to treatment condition and statistically compared among groups (Hotelling's inverse T matrix). The plots in A (stroke plus vehicle treatment) and B (stroke plus CX1837 treatment) show the location of labeled axons in groups of animals (n = 4 for each condition). For CX1837-treated mice, there is no difference in the spatial distribution (C) relative to vehicle-treated stroke controls. Polar distribution plots, incorporating normalized axon quantity and distribution of axons in register with connectional plot (D). Shaded polygons (D) represent 70th percentile of the distances of labeled axons from the injection site in each segment of the graph. Inflection point in CX1837 effect on infarct size. Representative Nissl-stained sections 7 d after stroke from stroke plus vehicle treatment (A), stroke plus CX1837 treatment starting at the time of stroke (B), and stroke plus CX1837 treatment starting from 5 d after insult (C). Quantification of the stroke volume is shown in D. Data are shown as mean ± SEM for n = 4 per group. *p < 0.05.